In our project we demonstrate an effective SUMO fusion based production system for antimicrobial peptides (AMPs). AMPs are attracting a lot of attention because of their potential as an alternative to antibiotics. Currently one of the reasons why AMPs are not widely used is the high production cost. A few grams of chemically synthesized AMP could cost up to 1,000 euros. This makes it difficult to compete with the antibiotics on the market. But with synthetic biology, these AMPs could be produced in bacteria bringing down the cost and making mass production possible. Since E. coli is the most robust, well documented and commercially available recombinant expression host, we aimed to utilize its properties even though DCD-1L is active against E. coli. We managed to produce high yields of AMPs, around 20-30 mg.
We designed constructs His6x-Smt3-DCD-1L, Smt3-DCD-1L-22 aa linker-CBM, His6x-Smt3-CBM-22 aa linker-DCD-1L, His6x-Smt3-LL-37. We successfully cloned these constructs and confirmed them by sequencing. 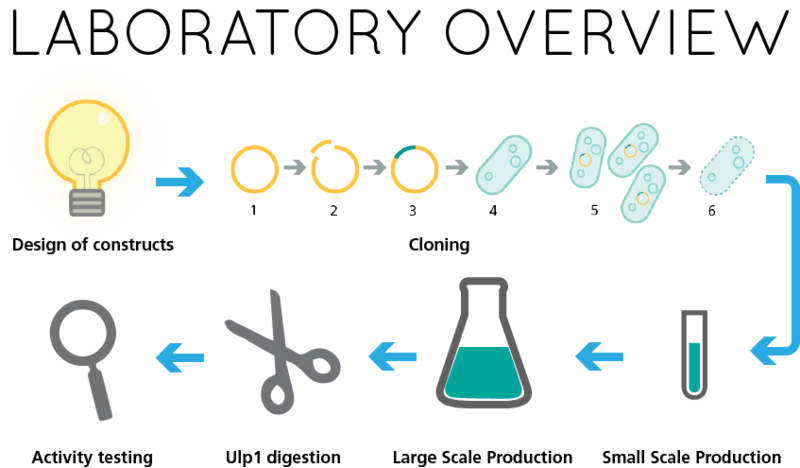 Even though initially our aim was to produce our peptide in large scale, we started with small scale first to make sure that our expression system works as designed, the antimicrobial peptides do not show toxicity to the expression host in the form of a fusion peptide and E. coli, our expression host, is able to express the gene of interest. Firstly, it is clear that our promoter system has a strong control and works without leakage. As shown in the results section, in our system the antimicrobial peptide is first produced in an inactive form due to the Smt3 fusion, thus it does not kill the expression host. From the gel images of the small scale production, it can be clearly observed that the protein of interest was soluble as it was detectable in the cell lysate. Following the confirmation from small scale expression and purification experiments, we successfully scaled up our production system for large scale, 500 ml batch, and purified using the His-tag affinity method. After purification, using protein concentration columns we performed both a buffer exchange step and obtained our proteins in higher concentrations. The purification was further confirmed with SDS-PAGE images from large scale production and purification revealing bands corresponding to the respective constructs. We managed to produce high yields, around 20-30 mg, of AMPs. Another significant aspect our laboratory results reveal is the fact that Ulp1 enzyme is able to cleave the Smt3 tag with the His6x tag upstream of it, leaving the antimicrobial peptide in an active form. To ensure that the produced peptides were of correct sizes and there was no scar left from the Ulp1 digestion, we confirmed the sizes of the cleaved and uncleaved constructs with MALDI. We also carried out cellulose binding assays to see if the the cellulose binding module works and we demonstrated their activity. After production we carried out antimicrobial assays and observed that DCD-1L and LL-37 killed the E. coli cells. However, in our experiments we only observed antimicrobial activity with significantly higher concentrations than the minimum inhibitory concentrations reported in literature. This might be due to the low salt concentrations used during the experiments compared to the natural sweat environment. Thus, we carried out further computational studies, which can be found from the modeling section. Overall, we suggest a novel production system, not only for dermcidin but also possibly for other AMPs, that reduces the production costs of AMPs in large scale, thus enabling their wide usage as common antibiotic alternatives.